If it hasn’t happened already, at some point in your life, you will have a stuck, rusted, stubborn, or frozen nut or bolt to deal with when handling with different machines, like cars. After all attempts at tugging it with the wrench have failed, it is time to resort to a much superior and surprisingly pocket-friendly alternative: the breaker wrench. It could be that the torque specifications of the bolts or nuts far exceed the strength of your arms even with the best ratchets at your disposal. In the case of the nuts or bolts physically bonding with the other part because of time-related corrosion and rust, your only best alternative remains to be the breaker bar. Rather than having a ratcheting mechanism, breaker bars have a strong swivelling head that easily attaches to sockets. The considerable length of breaker bars allows for the application of ample torque for effortlessly, quickly and smoothly dislodging the toughest nuts and bolts, whether they are stuck, stubborn, frozen or have, over the years, corroded to bond with the machine. Breaker bars have no moving parts which, coupled with their tough and robust construction, usually from chrome-vanadium steel, means they won’t be breaking easily even when subjected to significant abuse. And on the off-chance that they do, they are relatively budget-friendly and can, therefore, be replaced without digging any deeper into your pockets. With thousands of breaker bars currently flooding the market, selecting the right one will understandably be a difficult endeavour, particularly if you don’t know the first thing about them. To help you out, we’ve dutifully taken it upon ourselves to lighten you on the features you need to pay attention to and how to narrow down your search till you end up with the most suitable breaker bar. We hope the list helps you unite you with your dream breaker bar. 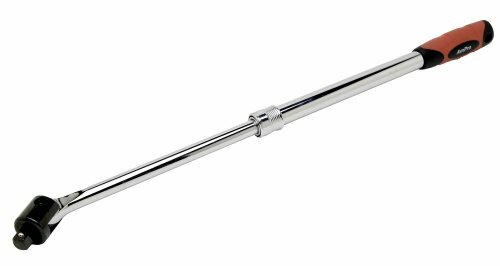 The Tekton 15356 1/2-Inch Drive bar is an ideal breaker bar for people looking for a perfect balance between construction quality and reasonable pricing. Given the simplicity of breaker bars and the fact that the market is flooded with different types of them from different brands, there isn't much difference between them with respect to functionality. The only important factors that differentiate them is quality of finish and fit, the socket attachment point, and price. The Tekton brand is renowned for manufacturing various versatile and durable breaker bars ranging between 3/8-inches and 3/4-inches, of which the TEKTON 15356 is one. Like all breaker bars emerging from the Tekton production line, this bar has the ruggedness and robustness that makes it ideal for taking on the most demanding tasks on the job site. For one, it is made from industrial-grade chrome vanadium steel which is ultra-strong and yet lightweight and compact. The lightweight and compact design is yet another selling point worth exploring. Aside from enhancing manoeuvrability and controllability, the lightweight and compact design minimize the chances of experiencing fatigue and developing blistering on your hands or straining them while working on rusty and stubborn nuts and bolts. Couple the design and the fact that the tool comes with a head capable of rotating a full 180-degree and you have a tool that allows for the effortless and quick accessing of bolts and nuts from several angles. The impressive features do not end with there. The flex head, for instance, comes with an anvil on one extreme end featuring a spring loaded ball bearing ensuring that sockets fit in securely and safely and that they produce this confirmatory click sound after successfully installing. The Tekton offers the TEKTON 15356 in various lengths allowing you to customize the length of your breaker bar in accordance with your requirements. Keep in mind that the longer ones are more apt at creating additional torque for loosening bolts and nuts quickly and with minimal effort. As already mentioned, the TEKTON 15356 features high-end finish. 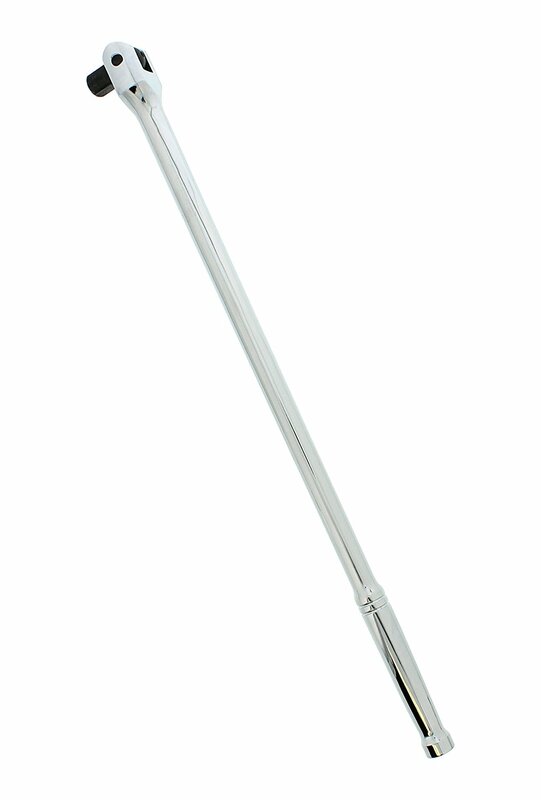 The polishing of the finish gives the breaker bar an up-market look and gives it a smooth touch. As a result, cleaning the tool after spending the whole day loosening bolts and nuts will prove to be an easy and quick endeavour. Also, because of the ergonomic design of the tools, they are able to provide you with exceptional comfort and functionality you won't find with cheaper models. With proper use and regular maintenance, this breaker bar is going to provide you with several years of reliable and exceptional service. The fact that they’re reasonably priced means you don’t have to break the bank to own one. It’s a worthy investment for people looking for longevity and practicality. If you have one of those rusty, stubborn nuts or bolts that has just refused to come out no matter what you do, maybe its high time you invested in the Neiko 00206A 1/2 in. Drive x 24 in. bar. Like the first product on this list, the breaker bar is constructed out of pure vanadium steel without the slightest trace of plastic components, meaning that it’s going to take a great deal of force to break it. Apart from remarkably preventing tear and wear, the use of vanadium steel also makes it possible for the product to provide you with peak torque for quickly and easily loosening that rusty and stubborn nut. The full 180-degree swivelling head of the Neiko 00206A is yet another of its keynote features and one that makes it immensely appealing to mechanics, construction workers and even enthusiastic Do-It-Yourselfers from all over the world. The flexible head gives the user superior leverage; you don't have to assume awkward postures or twist your wrist to reach a bolt or nut in a hard-to-reach spot as you can do so comfortably and seamlessly from a multitude of angles. With its 24-inch handle, turning lug nuts and bolts will be a breeze. Another proof of the superb construction quality is the fact that it meets and far exceeds the ANSI-standards of quality, meaning that its performance is much superior to that of poorly constructed units flooding the market. To guard against the possibility of it slipping inadvertently from the hand while working, the manufacturers included a contoured grip. The feature guarantees the tool fits snugly and securely in a vast majority of adult hands to enable you to work for hours on end without hurting your fingers. Also, because the product comes in a mirror-chrome finish, it has the ability to effortlessly repel corrosion and rust, meaning that it will retain its flawless and smooth looks for several years. The spring-loaded ball bearings, on the other hand, provides for a secure fit. 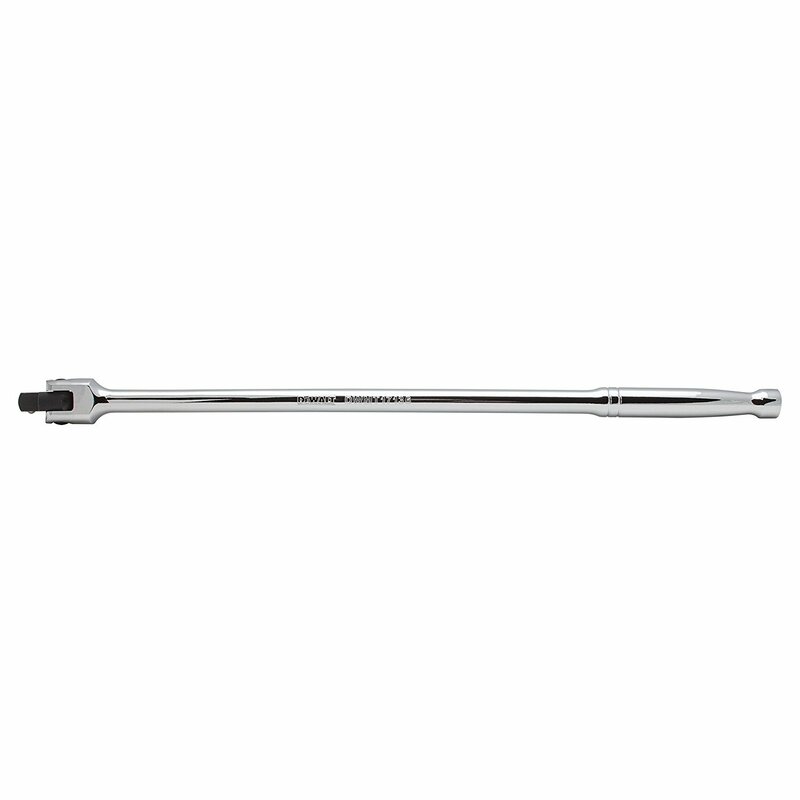 Overall, the Neiko 00206A is a breaker bar built solidly and professionally to provide you with the best wrenching experience. If you have a decade-only bolt that just won’t come loose, you surest best would be this breaker bar. It is strong, durable, practical and very functional and will quickly prove to be an indispensable companion in your toolbox. The 24-inch handle takes the effort from removing the tightest and tightly frozen nuts with minimal force. If you want to settle for nothing less than the absolute best when it comes to performance, take a keen look at the Performance Tool W32126 1/2-Inch Drive 30-Inch Breaker Bar. The breaker bar has so many impressive features we’re having a difficult time deciding where to begin. The feature that will immediately catch your attention is the elegance of its design; its exceptional 30-inch length raises the performance bar a little too high for other breaker bars. The sheer length of the handle provides you superior leverage, minimizing the effort you have to use. 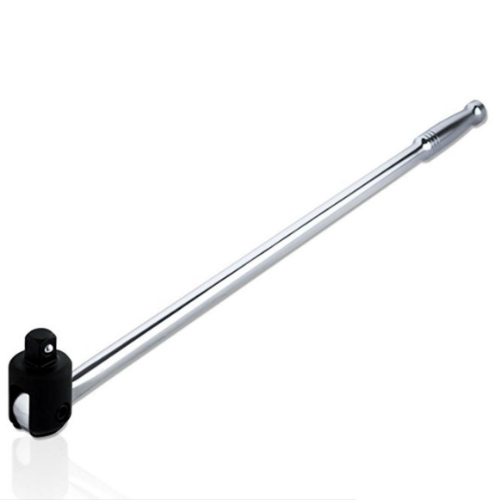 This breaker bar is very different from your typical breaker bar, in spite of the deceptive physical appearance. The Performance Tool W32126 also features an all-vanadium steel construction meaning that even if you subject it to heavy-use on the busiest work settings under different climatic conditions, the likelihood of the performance dwindling is very remote. Which also means it won't get easily dented or bumped from high impact occasioned by being dropped on the hardest floors or being used on the toughest bolts and nuts. The polished nickel chrome plated finish gives it great resistance to rust and corrosion, allowing to look new and crisp throughout its lifespan. With proper use in line with the instructions provided by the manufacturer, the product should provide you with more than a lifetime of trouble-free and exceptional performance. As for versatility, it is equipped with a convenient and time-saving 180-degree flexible head to give you the easiest time breaking or loosening that are either frozen, rusted, or just stubborn. The flexibility of the head means you don’t have to restrict yourself to one uncomfortable angle while loosening or breaking stubborn or frozen nuts. The freedom to work from different angles gives you incredible leverage particularly in hard-to-reach positions, enabling you to finish loosening bolts and nuts in a heartbeat. The Performance Tool W32126 is an ideal fit for people looking for an easy to use and versatile breaker wrench for dislodging and loosening nuts and bolts. Its sturdy construction means it can be used in the toughest work sites without worrying about it breaking. Because of its ergonomic design, it is easy to use for longer without fatigue. There is a multitude of reasons why homeowners, contractors, mechanics, and even enthusiastic Do-It-Yourselfers resort to the Capri Tools 1/2-Inch Drive Extension Breaker Bar whenever they have stuck and stubborn bolts and nuts that need loosening. The dynamic performance of the tool, for one, makes it hugely appealing to users who need nothing short of a straightforward and hassle-free operation, and that is exactly what the breaker bar offers; it performs as advertised. While it may lack the bells and whistles of its premium counterparts, when it comes to getting the job done accurately and in a timely fashion, this breaker bar never disappoints. Like you would expect from a breaker bar of its class, it features an all-chrome vanadium construction. Coupled with the expertise and experience of Capri Tools engineers, you are sure the breaker bar will withstand heavy-use no matter how demanding and challenging the job is. Because chrome vanadium is rugged and tough, the possibility of the tool breaking or suffering dents from being used on some of the tightest nuts and bolts is non-existent. If it helps sway your purchasing decision, you’ll be pleased to learn that this breaker bar meets and exceeds DIN 3122 standards. Couple with its lifetime warranty, we can only foresee exceptional performance for the next several years. With its 1/2-inch drive and length of 24-inches, it boasts a torque capacity of 377 feet-pound, making it the perfect choice for undertaking light-duty to medium-duty projects. In addition to this, it comes with a spring-loaded ball bearing that holds sockets securely. The other equally significant aspect of the product’s construction is the utilization of high-quality chrome-moly. The biggest advantage to spotting a chrome-moly finish is that it keeps rust and corrosion at bay, meaning that you are liberty to use the Capri Tools bar in the dampest locations without a care in the world. It would be foolhardy to buy the most expensive breaker bar only to have difficulties using it, which is why manufacturers make a point of ensuring their products are as easy to use as possible. And this bar is no exception. 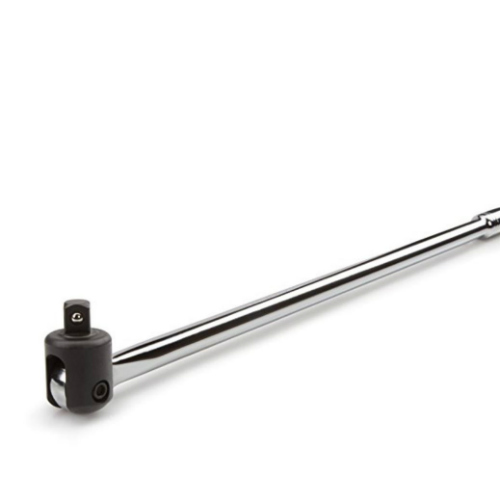 To this end, the breaker bar comes with a 180-degree easily adjustable chrome-moly head. The implication of the design is that you can dislodge or loosen nuts and bolts from different objects from a multitude of angles and without have to restrict yourself to one uncomfortable or awkward angle. Other than preventing against the likelihood of twisting your wrist or fingers while working, the flexibility of the chrome-moly flex head also accords you exceptional control and manoeuvrability. As a result, other than being easy to use, the Capri Tools bar is also one of the safest breaker bars currently on the market. If you need an all-around breaker bar for confidently undertaking a plethora of projects both at home and on the work site, it would be a perfect fit. It features durable and professional construction and proper care, it should last for more than a lifetime. You’ll never be disappointed in its performance. Craftsman is a brand that needs little introduction, having been in the tools and home improvement industry for several decades. Its products are synonymous with high-quality construction, durability and versatility and the Craftsman 9-4431 is no exception. 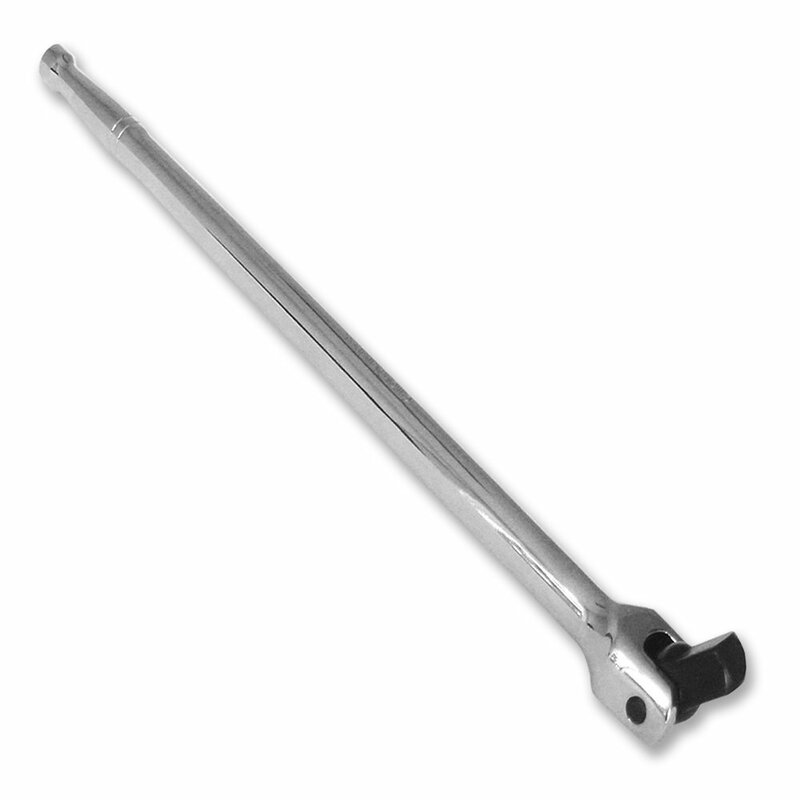 The tool features an exceptionally strong 100-percent alloy steel construction, which means it is an ideal breaker bar to use for dislodging and loosening the most abrasive nuts and bolts from such objects as cars. The use of ultra-strong alloy steel also means the machine can gracefully take on normal, everyday use around the house. And when the setting changes to the busiest work site, there'll be no performance issues as it can hold up to plenty of abuse, be it within the confines of the workshop or on the construction site. The manufacturers generously provide you with a lifetime warranty with each purchase but it's not like you're going to need it seeing as alloy steel would require a tremendous amount of force to break. Another important design highlight includes positive stops at 0-degrees and 45-degrees, both of which are aimed at making the Craftsman 9-4431 one of the most accurate breaker bars on the market. Days of uncomfortable ratcheting angles are long gone with the thoughtful incorporation of a hinged joint. Compared to most breaker bars, it is fitted with a relatively short 18-inch flex handle, a drawback it immediately compensates for by featuring a flat rather than spherical handle. The result is a firmer grip on the handle that significantly minimizes the possibility of slippage, which in turn translates to greater leverage for flexing the breaker bar when dislodging nuts and bolts. The compact and lightweight design is yet another marvellous aspect of its construction that admirers and the sceptical are finding hard to fault. If you need superior manoeuvrability and controllability, especially when trying to access hard-to-reach nuts and bolts, the design will be of immense assistance. With a weight of just 2.8 pounds and dimensions of 21-inches by 7.2-inches by 5.2-inches, the risk of straining your hands while working are minimal. The Craftsman 9-4431 also won't take up too much storage space in your garage or the trunk of your car at the end of the day. Other than making the activity an effortless endeavour, it will also ensure you take the least time possible to loosen stubborn, frozen, rusty and stuck bolts and nuts. In spite of its impressive performance and durability, this breaker bars has just one major drawback. The swivel on the machine is a little loose, and this might compromise your accuracy or productivity or both. It is not a deal breaker though, considering the pros of this breaker bar far outweigh the cons. To conclude, you’ll find that every aspect of the Craftsman 9-4431 is more than satisfactory, from its quality of construction, durability, and flexibility. It has a generously long lifetime warranty to take care of any manufacturing-related defects, which should give you peace of mind. Plus, despite being an entry-level breaker bar with a pocket-friendly price tag, it offers you all the premium features typically found in top-of-the-line breaker bars. With time, the Craftsman 9-4431 Flex Handle 3/4-Inch Drive and 18-Inch Long Breaker Bar will prove to be a worthy investment when you have a rusty, stubborn nut or bolt to loosen quickly. Compared to other breaker bars featuring on this list, the Crescent CRW16 is conspicuously short. Nevertheless, the machine more than makes up for it by offering you incredible balancing, reliability, efficiency, and durability, a perfect combination of attributes rarely found in breaker bars these days. And when it comes to performance, the Crescent CRW16 is no slouch either. It helps you to smoothly, confidently and quickly dislodge, break, or loosening the toughest nuts and bolts you can ever come across. The lightweight and compact design is one of its keynote features. With measurements of 19-inches by 2-inches by 1.5-inches, and featuring a weight of only 1.9 pounds, you’re sure you will have the easiest time using the breaker bar. For overhead jobs, the weight is not too much as to weigh you down or cause hand fatigue, if anything, it is so trivial that you can work incessantly all days without realizing the breaker bar is actually in your hands. The ergonomic design of the handles also aims at facilitating comfort while increasing traction in an attempt at minimizing the possibility of the tool slipping from your hands. Longevity should be the least of your concerns if you’re thinking of purchasing the it. For one, it is precision crafted from one of the most rugged and durable materials on the planet: chrome vanadium steel. Other than being renowned for being incredibly long-lasting, chrome vanadium steel is ultra-strong and is a prudent choice if you don't want your breaker bar to, you know, break under excessive force. As a result, the Crescent CRW16 is capable of providing you a level of performance and durable that’s at par, if not exceeding that of some top-model breaker bars. To further aid in durability, the breaker bar comes with a chrome-plated finish that is resistant to corrosion and rust, enabling you to use it in all sorts of environments without having to worry about any significant impact to its shelf-life. And it's not like you're going to have a problem using it. The 18-inch handle leaves you sufficient room for generating enough torque for removing the toughest nuts and bolts with minimal effort. Aside from meeting or exceeding ANSI and ASME standards, the handle is similarly guaranteed to give you maximum satisfaction, irrespective of the nature of the job you're contemplating on undertaking. The Crescent CRW16 is elegance both in design and performance and proceeds to overshadow other breaker bars in all the important aspects like ease of use and durability. Its sturdy and rugged construction means it will neither bend nor break during use. Plus, it has very few competitors in the industry when it comes to reliability. The handle easily pivots to take the effort away from dislodging and loosening bolts and nuts. You’ll enjoy faithful and reliable service if you choose to go with the Crescent CRW16. Another leading brand in the breaker bar field is the AmPro, and despite being relatively unknown compared to the more established brand names, its products are nonetheless just as exceptional. One of their best breaker bars is the AmPro T20729 1/2-Inch. Other than its performance matching those of other breaker bars in its class, the product is similarly quite flexible and all-rounded, allowing you to take on a plethora of projects around the house and on the job site. Consequently, it is a perfect fit for homeowners, contractors, and enthusiastic Do-It-Yourselfer from different parts of the world. Now, let's delve a little deeper into the features and specs of the AmPro T20729 that make it worth considering. To begin with, and you would expect of a breaker bar, it features top-end construction by experienced and dedicated engineers. The use of high-quality materials ensures the machine lastly for the next several years, irrespective of the abuse and heavy-use it is subjected to. The innovative design of the breaker bar meets and even exceeds the most rigorous quality standards in the industry, and such a quality assurance should give you a peace of mind knowing you’ll never come to any kind of harm while using the machine. Aside from the chrome vanadium steel construction, the breaker bar also comes with 4 locking positions in addition to its 180-degree swivelling head. The machine also incorporates state-of-the-art technology and is built with the user in mind, to give them the best possible time while dislodging, breaking or loosening all types of bolts and nuts from all types of materials and objects. While the breaker bar comes with a budget-friendly price tag, it nonetheless delivers exceptional quality and will adequately address all your needs, both around the house and on the job site. The tool is surprisingly precise and functional and works around the clock in ensuring the absolute best performance while maintaining a level of simplicity that ensures it is easy to use. The handle, for instance, is extendable between 16 and 24-inches, which in turn translates to greater leverage for removing the most stubborn nuts and bolts with the least effort and as quickly as possible. The fact that the handle comes with cushion grip TPR means they are comfortable to use for longer and without the risk of injuring your hands. With these qualities, it is by far one of the best breaker bars on the market, especially considering that it guarantees you ultimate satisfaction. Considering its sturdy and professional construction using top-quality materials, the AmPro T20729 is a worthwhile investment and therefore ideal for individuals looking for professional performance. It comes with a useful lifetime warranty for repair and replacement of defective parts, giving you the peace of mind you need to confidently take on the biggest projects at home and on the work site. If you need smooth and trouble-free performance, the AmPro T20729 is exactly the tool for you. The DeWalt brand has been in the business of manufacturing high-quality, versatile and durable power tools and other equipment for home and commercial use for decades now. The brand, consequently, does not need any introductions at all, even to the novices who are having their first go at breaker bars. Coming from the customer-trusted brand, the DeWalt 3/8" Drive Breaker Bar is built to last. With regard to construction quality, you know the tool is hard to beat. It is sturdily and professionally made from Chrome Vanadium Steel to allow it withstand rigorous use in the busiest work sites without the slightest drop in performance quality. Coupled with its perfect finish, the tool will last for the next several years provided it is used correctly in strict adherence to the instructions provided by the manufacturer. The finish ensures things like rust and corrosion are no longer a concern, in addition to giving it modern and sleek looks. Ease of use is guaranteed by the ergonomic design of the handles. Despite being short at just 15-inches, you risk the likelihood of injuring your arms or fingers from attempting to loosen or dislodge the tightest nuts and bolts. The height, coupled with the 180-degree swivelling head of the breaker bar means you’ll be dislodging nuts without expending too much effort and without taking too much time. The ergonomic handles are easy and comfortable to handle for extended periods of time. Another factor that facilitates ease of use is the fact that the DeWalt breaker bar is both lightweight and compact. It weighs a paltry 14.4 ounces with dimensions of 14.9-inches by 0.9-inches by 0.7-inches, meaning that you’ll have the easiest time accessing the hard to reach spots around the house or workshop. Also, because it is lightweight and compact, you have the advantage of greater controllability and manoeuvrability, which in turn translates to precision and the best loosening results, no matter how tough, rugged, stuck or stubborn the nuts and bolts are. The lifetime warranty is yet another advantage to purchasing it. It means you’ll never have to dig into your own pockets to cater for repairs or replacement of parts that malfunction out of normal, everyday use. As a result, you’ll have the confidence to work tirelessly on your projects with a care in the world. In light of the product robust and durable construction, we doubt if you’ll ever need to use your warranty at all. To recap the main points, the DeWalt 3/8” is a high-performance breaker bar whose versatility, durability and ease of use perfectly reflect DeWalt’s dedication to the production of top-quality, functional and versatile products. If you need value for your money, we’d recommend giving the breaker bar some serious consideration. If you need absolute versatility, the ability to work efficiently and confidently at all sorts of angles all the while enjoying maximum leverage for effortlessly dislodging and loosening various nuts and bolts from the hardest to reach spots, then the ABN Extension Bar is the tool for you. It has pretty much everything you need in a practical and functional breaker bar. Whether its versatility, high-performance, and ease of use, durability, or high-quality finish you have your eyes set on, the breaker bar never fails to deliver. Removing stubborn, stuck, rusty, or frozen nuts and bolts has never been easier before. The design ensures you have an additional advantageous leveraging for effortlessly breaking, loosening and dislodging all kinds and sizes of nuts and bolts that get stuck. And that’s not all, not even the tip of the iceberg. To provide you with superior versatility, the ABN Extension Bar, 1/2” Drive x 18” Inch – 180-Degree Rotating Head is equipped with a useful, convenient and time-saving 180-degree swivelling head. The advantage to the rotational capabilities of the head of the product is that you’ll be at liberty to work from any angle you’ll find most convenient, thus providing you with the optimal leverage for working tirelessly in hard to reach spots. No longer will you have to confine yourself to single spot or risk twisting your arm if you just tried wiggling a little room for dislodging the toughest nuts and bolts. In addition to the ease of use, it comes equipped with a spring-loaded ball bearing for securing all regular SAE 1/2-inch sockets firmly in position. 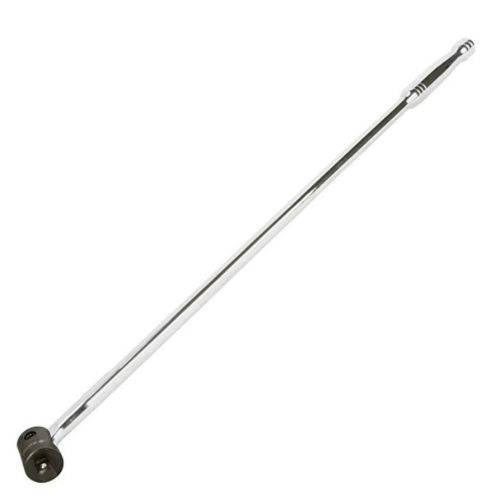 The 18-inch long steel handle shaft of the bar, as already mentioned, provides you with more than adequate leverage for loosening bolts and nuts effortlessly and quickly. To further guarantee ease of use, the manufacturers thoughtfully added a comfortable grip to guide against hand fatigue or the development of blisters, all the while ensuring additional productivity. The implication here is both experienced workers and novices and just about any other person will have the easiest time working with it. Lastly, as you would expect of any breaker bar on featuring on this list, construction quality is top-notch. For its part, it is made from ultra-strong yet lightweight and compact chrome-vanadium steel, ensuring it smoothly withstands abuse and heavy use on different work sites. The head, on the other hand, is built from chrome-moly making it both strong and durable to stand up to rust and corrosion. With proper use and care, it won’t come as a surprise if the product lasts for more than a lifetime, as it should. With the ABN Extension Bar, you have a sturdy, versatile, high-quality and high-performance breaker bar. Like all other breaker bars on this list, it both easy to use and all-rounded. It would be a worthy investment for homeowners, enthusiastic Do-It-Yourselfers, and professional mechanics. Aside from having a warranty against defects in materials and workmanship, the breaker bar is incredibly affordable. Despite coming last on the list ten of the best breaker bars, the Neiko 00211A is loaded with several impressive features, just like all other breaker bars. The product is essential for all professional and enthusiastic Do-It-Yourselfers around the world. Its indispensability is particularly informed by the fact that it is precision crafted from highly long-lasting drop forged chrome vanadium steel allowing it to take all sorts of abuse and abuse in its stride, unlike other breaker bars that would over time begin to bend and dent. The unit’s mirror polish finish does an astounding job preventing the devastating and damaging consequences of rust and corrosion, which makes it possible for you to use it in different environmental settings. A feature that separates it from its competitors is that rather than spotting the industry standard edge locking mechanism, it comes with a square driver radius corners that aim at reducing socket wear as it locks on to the sides of the nuts and bolts instead of the edges. The design ensures that even with frequent fastening and unfastening, the likelihood of your bolts and nuts wearing out much quicker are minimized. The head comes with full 180-degree rotating capabilities to give the easiest time in manipulating nuts and bolts lying in tight spots at several angles. Consequently, you'll no longer have to risk twisting your arms or fingers attempting to reach awkward corners. In addition to the features mentioned above, it also has a spring-loaded ball bearing that makes sure the secure locking in of bolts and nuts to prevent them from falling into engine parts. And while loosening, breaking or dislodging those rusted, tough, stuck, or frozen nuts and bolts you won’t have to expend too much energy or time in the endeavour as the breaker bar has a sufficiently long 18-inch handle providing you with ample leverage for amplifying torque. The Neiko 00211A is both lightweight and compact, as would be expected of a breaker bar. Weighing just 3.6 pounds and with dimensions of 19.9-pounds by 2-inches by 1.4-inches, it is quite easy to manoeuvre and control while accessing hard-to-reach spots. Also, the thoughtful design of its handle increases comfort and ease of use, making it possible to use the breaker bar for hours on end with minimal fatigue. If you need a simple, easy to use, yet functional and reliable breaker bar for light-duty to medium-duty projects around the house and on the job site, look no further than this option. 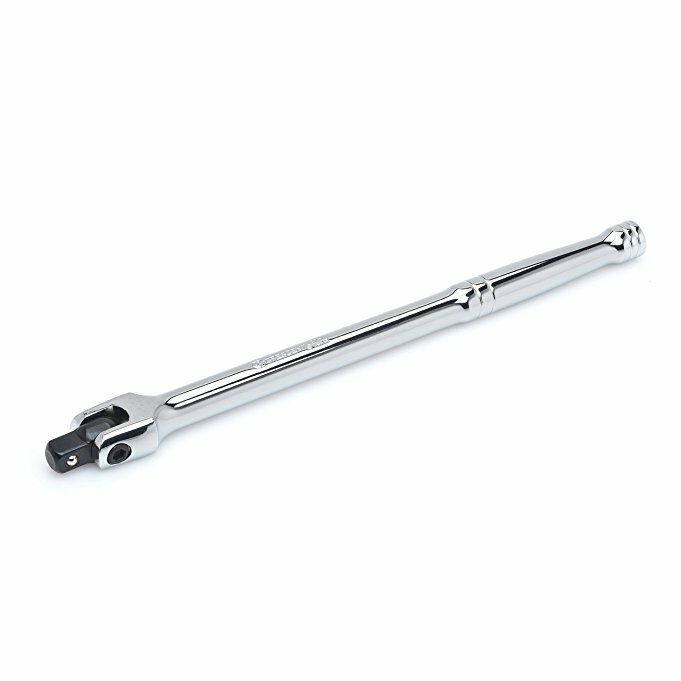 The 18-inch length provides you with ample leveraging for effortlessly and quickly loosening lug nuts and bolts. The breaker bar is built to last and will provide you with a lifetime of hassle-free operation, which is something that cannot be said of other breaker bars. Breaker bars are made from only the toughest and highest-quality materials to make them durable and capable of withstanding excessive abuse and heavy use in all sorts of different work settings. A majority of manufacturers tend to prefer chrome vanadium steel over other materials for two main reasons: other than the material being ultra-strong an durable, it is similarly lightweight and compact. The use of tough materials guards against the likelihood of the unit breaking or denting while in use. Also, if you’re interested in longevity, keep a keen eye for the quality of finish as it makes a whole lot of difference between using your unit for a lifetime and replacing it every year. The use of chrome-moly finish, for instance, other than giving your unit a sleek and contemporary look, also prevents corrosion and rust, meaning that you’ll have the freedom of using the unit in all sorts of weather conditions. Considering that you’ll be using them to loosen tough, stuck, frozen or corroded bolts and nuts, breaker nuts should provide you with a trouble-free and smooth operation. To this end, pay attention to the design and length of the product’s handle. It is long enough and does it feature a safe grip? A long handle shaft gives you ample and superior leverage necessary for loosening and dislodging those tough and stubborn nuts and bolts in a quick and effortless fashion. A breaker bar with an ergonomically designed handle increases comfort and ease of use by keeping hand fatigue and blisters at bay, allowing you to work comfortably for several hours on end. Closely related to ease of use is the physical dimensions of the breaker bar. A lightweight and compact unit is easy to control and manoeuvre, and it fits into hard-to-reach spots relatively easily. Additionally, if your product comes with a swivelling head, it would go a long way in facilitating ease of use as you can do your work from several angles rather than restricting yourself to just one. Come to think of it, the price is really not that an important consideration for buying a breaker wrench. Most of these units are quite affordable to the average American, and this should be reflected across the board. A majority fall within a price range of between $10 and $50. Anything below this and you’ll be compromising on essential features like ease of use and durability. A breaker bar costing anything upwards of $50 is also not worth the investment as its performance, ease of use, durability, construction quality, and versatility won’t be any different. Q: How do I best care for and maintain my breaker bar? A: Spending hundreds of dollars on a premium breaker bar is not a guarantee of longevity. In fact, it is more sensible to find one that has a long warranty as it assures you that defects resulting from the use of substandard materials or poor workmanship will be catered for. Anyways, caring and maintaining your unit is essential to keeping it in optimal performance condition. Religiously cleaning it after every use is important as it will be instrumental in keeping away rust and corrosion. Abrasive cleaners can strip off the protective coating of your unit, so endeavour to always use gentle cleaners. Ensure they air dry thoroughly before storing it is a cool, dry place. 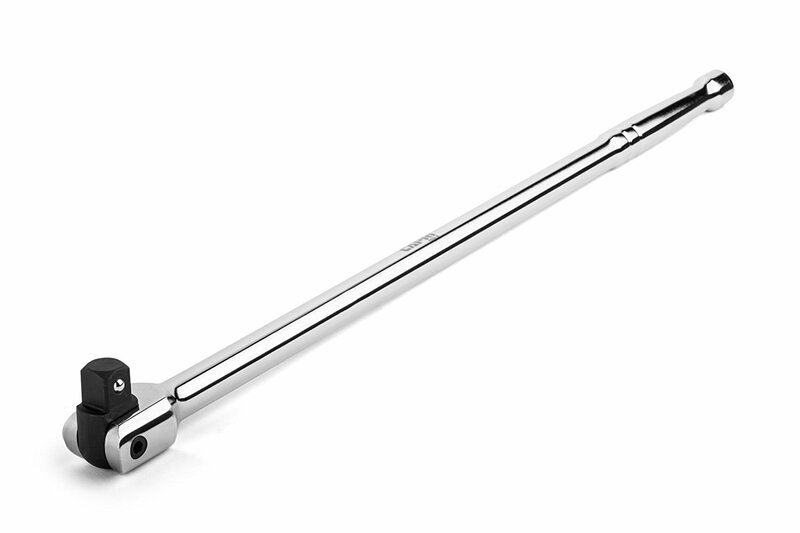 Q: How different is the breaker bar from a torque wrench? 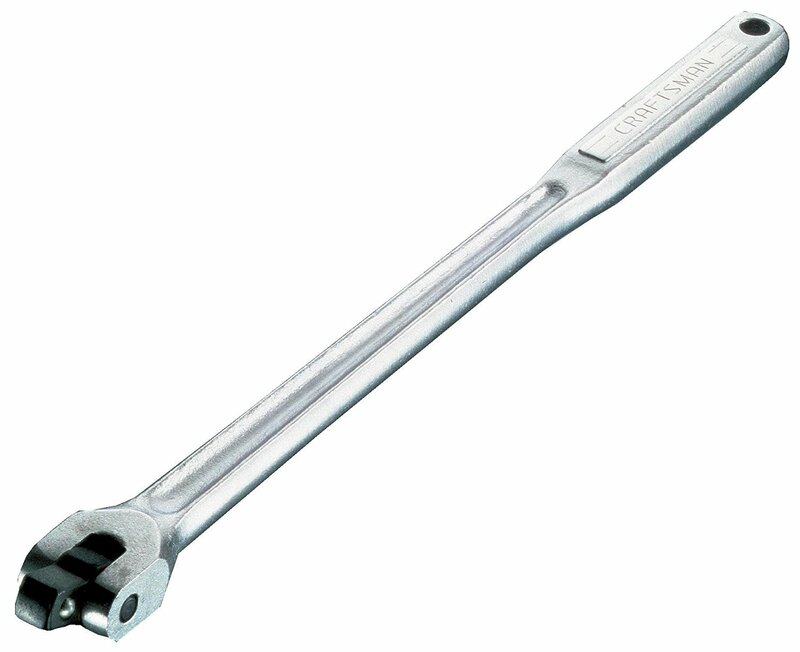 A: Despite having almost similar functions, breaker bars and torque wrenches happen to be very different. The former is a simple bar fitted with a flex head that fits securely into a socket and requires you to apply brute force to loosen stuck, stubborn, frozen or corroded nuts and bolts. The latter, on the other hand, works more like a ratchet and is ideal for tightening rather than loosening bolts and nuts. For serious Do-It-Yourselfers and professionals, a breaker bar is a must-have tool. They have several advantages over other methods of loosening, breaking, or dislodging nuts and bolts. Aside from their precision, breaker bars are lightweight and compact, easy to use, versatile and very long-lasting. You can never know the next you’re faced with a frozen nut or bolt that just won’t budge no matter how hard you tug at it. In such situations, breaker bars prove to be very indispensable, requiring a fraction of the effort and time you would otherwise expend on other means. And our list features the best of the best of them. We hope it helps you make an informed decision.